Heyyyy everyone! Between putting our condo up for sale and getting our new house ready to move into, annnnnnd my dental work annnnnnd a trip to NY (you’ll hear more about that in the future! ), I’m feeling a teensy tiny bit overwhelmed. So, I’ve enlisted a number of my favorite ladies to help me out with some fabulous recipes spattered over the next few weeks (with a bunch of mine mixed in as well, of course). Hopefully you’ll get some great recipe ideas and meet some new great food bloggers to follow. We’re starting off with the lovely and talented Amy of Very Culinary. Thanks Amy! 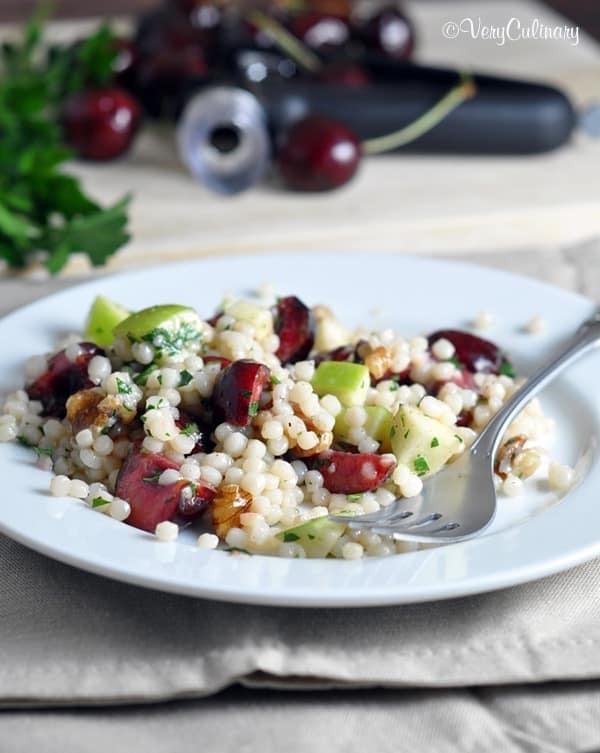 You’ll love this Israeli couscous with cherries and apples — a perfect blend of summer and fall! 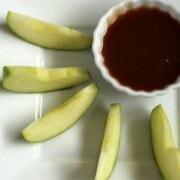 It’s an easy recipe perfect for entertaining. Happy to be filling in for Rachel today! How’s everyone’s summer? 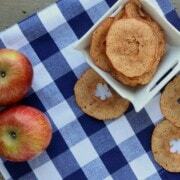 Filled with beach time, grilling, and fresh fruit? I hope. If I ever find seedless cherries, I might need to sell my car. But worth it, because they’re so good! And since cherry season is over so fast, I don’t mind paying a little extra. 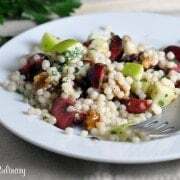 This couscous with cherries and apples is quick and easy, with minimal prep, and a perfect use of sweet, juicy cherries. It’s balanced out with crunchy apples, toasted walnuts, and a mustard-y dressing that lets us hold onto summer for just a bit longer. 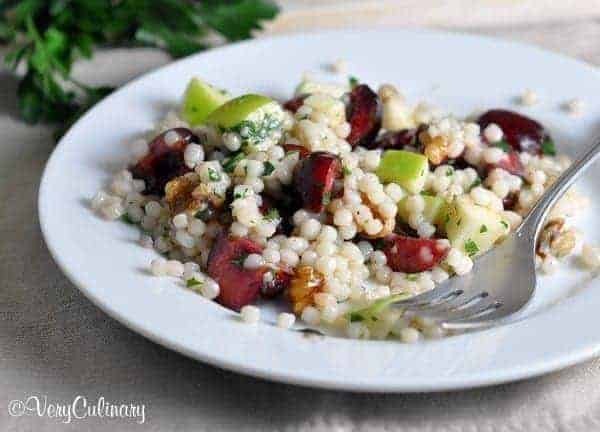 You’ll love this Israeli couscous recipe with cherries and apples — a perfect blend of summer and fall! In a medium pot, heat 1 tablespoon oil over medium heat. Add couscous and a dash salt; sauté until most of couscous is golden brown, about 3 minutes. Add the vegetable stock, increase heat, and bring to boil. Reduce heat to medium-low, cover, and simmer until liquid is absorbed and couscous is tender, about 10 minutes, adding more broth by tablespoonfuls if too dry. Transfer to a large bowl to cool. In a small bowl, whisk together the lemon juice, mustard, honey, pepper, and 1/4 teaspoon salt. Gradually add oil, stirring constantly. 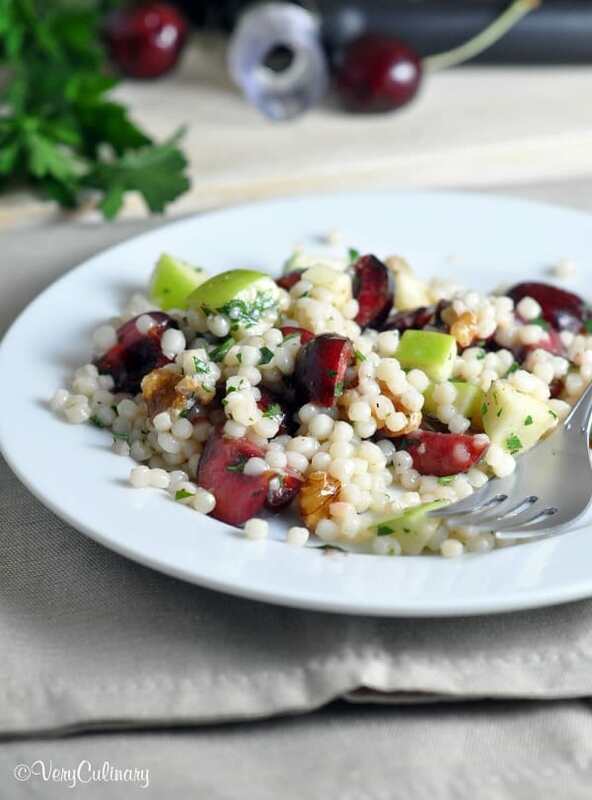 Once couscous is cool, combine with the cherries, apples, and walnuts. Pour dressing over mixture; toss to coat. Divide among individual plates and serve. I’m super obsessed with Iraeli cous cous. I buy it by the pound! love this salad! This sounds divine! Perfect for transitioning from summer to fall, too. Thank you, ladies!! It was fun sharing Rachel’s space for a day. Taylor and Medha – Israeli couscous is The. Best. and doesn’t compare to regular couscous at all. You must get your hands on some! Hysterical post! If you find seedless cherries, you’d better let us all know :) I’ve never had Israeli couscous but it looks gorgeous here, especially with the sweet cherries and apple. 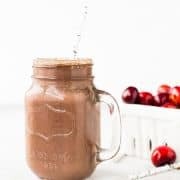 Love all the flavors of this dish…and I too would sell my car for some pitted cherries-you are clearly onto something! I’m pinning this one! Cherry season is over where I live, but I’m thinking blueberries instead . . . Looks fabulous! LOVE seeing Amy here. Good luck with the move and Amy, seedless cherries might be the greatest invention of all time! Selling your car? Worth it! Cherries are so great right now and I’ve spent way too much on them this summer. Israeli couscous…yuM! I had to laugh at selling your car…but, i agree, it would be SO WORTH IT! I love this flavour combo, but I have yet to try Israeli couscous! You just gave me a perfecto reason! Pinned!